Rapid growth in domestic oil and gas production, driven by technological advances in horizontal drilling and hydraulic fracturing, has allowed the U.S. to tap vast natural gas reserves. Over its lifecycle, natural gas emits nearly half the level of greenhouse gases as coal when burned. However, methane – the main component of natural gas – is a potent greenhouse gas. Methane emissions only make up one-tenth of US emissions, but methane released into the atmosphere has 25 times more global warming potential than carbon dioxide, the leading greenhouse gas. Methane can be emitted into the atmosphere in various ways, but it is estimated that one-third of methane emissions from human activities come from the production, transmission, and distribution of oil and natural gas. This is why the EPA recently issued standards to cut methane emissions from existing sources in oil and gas production and initiated the process to regulate existing sources in the future. Current methane monitoring devices have limited ability to cost-effectively, continuously, and precisely locate and quantify the rate of a leak. Oftentimes, operators cannot easily identify leak locations without the use of trained personnel and expensive monitoring equipment traveling to each individual site. Ultimately, this hinders the ability to find and then fix leaks economically. One can’t fix what one can’t measure after all. That’s where ARPA-E comes in. ARPA-E's Methane Observation Networks with Innovative Technology to Obtain Reductions (MONITOR) program, now in its second year, is making tremendous technical progress in developing low-cost, highly sensitive technologies for improved methane detection and measurement in the natural gas supply chain. MONITOR technologies are addressing shortcomings of existing technologies through several innovative approaches – such as remote sensing, advanced dispersion models, UAVs, and low cost print manufacturing, to name a few – that can cost-effectively estimate methane emission flow rates, localize the leak source, and provide continuous and remote monitoring. One of the biggest problems with methane detection is that you cannot easily see emissions, allowing leaks to go on unnoticed. To remedy this, Rebellion is developing portable methane gas cloud imagers that workers can wear while traversing a natural gas site. Imagine if every field operator’s hardhat were equipped with a Go-Pro-like camera that could detect and locate methane. With such widespread deployment, operators would notice more leaks more readily. Rebellion’s technology uses infrared imaging spectrometers to detect the location and concentration of methane. When the device detects methane, it streams real-time data of the methane plume to the worker’s smartphone, allowing operators to quickly respond and repair the leak. To date, Rebellion has created a functioning helmet-mounted prototype—the goGCI (see below!). Rebellion is also planning to launch a new product—the miniGCI in Q4 of this year. The miniGCI is an iterative step in Rebellion’s miniaturization and quantitative system development and will provide fixed-mounted applications. They are actively seeking early pilot partners for the fixed monitoring systems. Another challenge with methane detection is that leaks can pop up in countless parts of the oil and gas production system, requiring operators to monitor their equipment constantly. Aeris Technologies is developing a solution to this problem: a system that can be installed across a wellpad to provide for consistent, highly accurate methane monitoring. Aeris’ system can detect down the single parts per billion! Aeris’ technology combines a novel miniature spectrometer, a multi-port sampling system, and an advanced data analysis to identify and locate even tiny amounts of methane. Aeris’ approach combines a discrete number of gas sampling points (likely 1-4) and local wind measurements on the wellsite to feed a single sensor in a control unit equipped with real-time analysis software to identify leak location and size. The system will employ an advanced autonomous neural networks data analysis approach to discern between real leaks and regular, expected vents or emissions. When a leak is identified, the control unit will wirelessly transmit data to an operator via a distributed network, allowing her to quickly respond and repair the leak. To date, laser spectrometers to detect methane have been big, expensive, and power hungry. Aeris is redefining the state-of-the-art by combining a novel miniature multipass cell design with custom, low power electronics to achieve nearly a 15x reduction in the size, weight, and power consumption of the sensor core, which reduces requirements at the wellpad and decreases overall costs. Aeris is currently taking early orders on its “MIRA” systems (which include a rack mounted and portable version—see below!) that are based on the same technology. Current methane-sensing systems don’t have the ability to detect methane emissions accurately over long distances. Operators with multiple wellpads and equipment spread across large areas would need multiple methane monitoring systems – which can add a lot to operating costs. 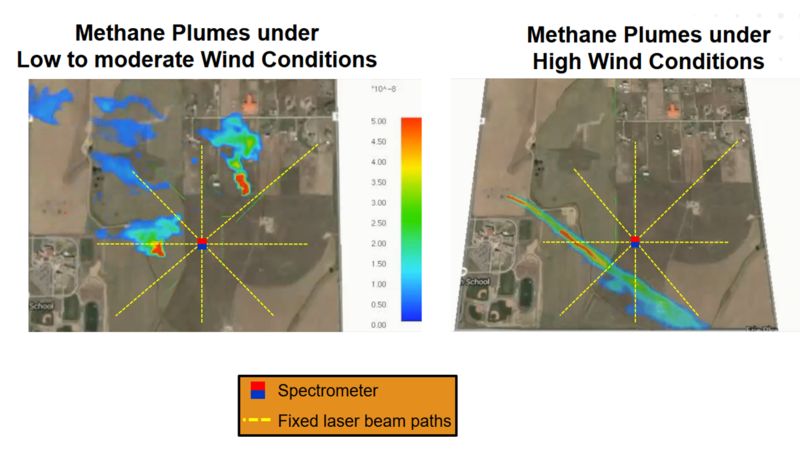 CU-Boulder is developing a dual frequency comb spectrometer (acts as 100,000+ well behaved lasers to probe methane absorption features) that can measure methane at minute quantities over mile-long distances. When incorporated with sophisticated inversion modeling, the comb could help survey large areas or multiple gas field simultaneously, eliminating the need for multiple, costly systems. Moreover, CU-Boulder’s technology can distinguish methane from other gases, like propane, ensuring the accuracy of methane detection. The CU-Boulder team is planning field deployments and testing beginning early this summer and is actively looking for an oil and gas industry partner for future technology demonstrations. If successful, these MONITOR technologies could change the cost, accuracy and efficiency paradigms of methane detection and measurement systems—and thereby enable a cleaner and more robust domestic energy production supply chain. 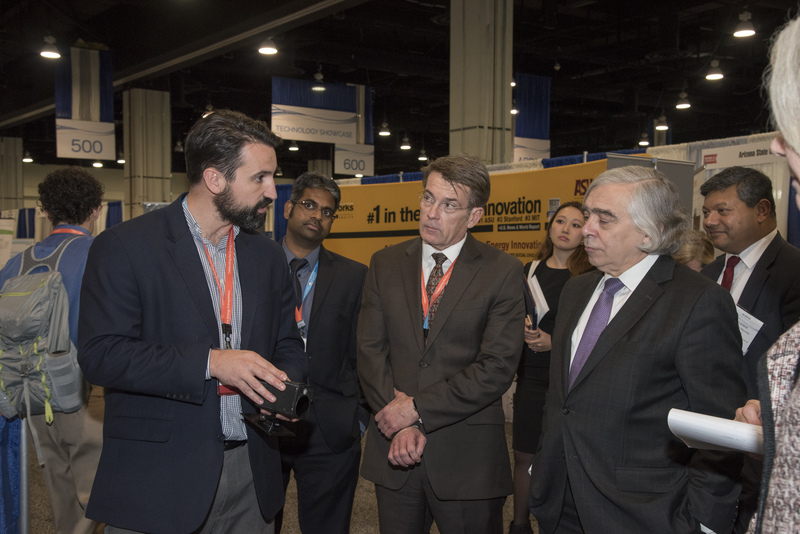 Sign up for the ARPA-E Newsletter to keep up-to-date on MONITOR, new ARPA-E programs, funding opportunities, and news about existing projects.